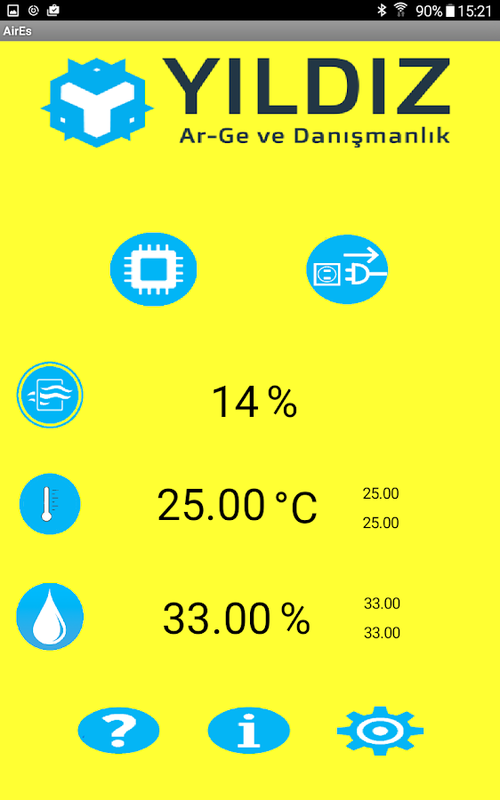 This application is used for tracking the indoor air quality,temperature and humidity, by using AirEs 2 Air Quality Monitors.You can change sensor warning levels in the application.Easy-to-useinterface provides clear information about air quality you breath,temperature and humidity, to your phone and/or tablet. 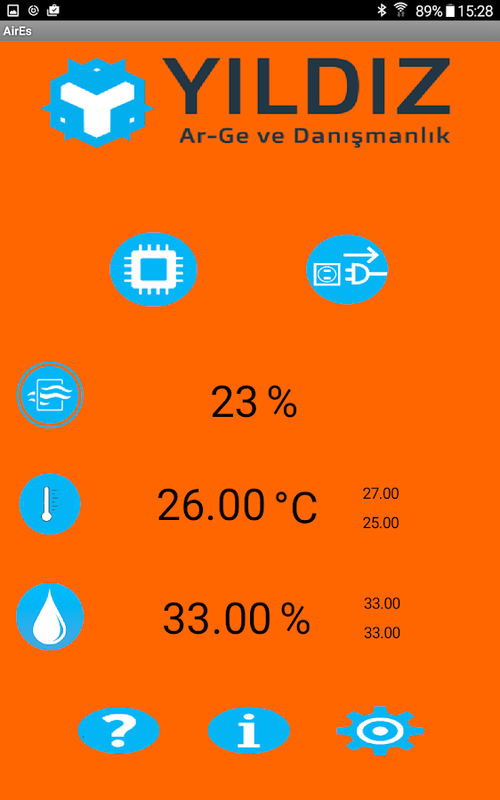 You can alsosee the lowest and highest levels recorded while the gadget ison.How to useTap the IC symbol to select the device to and tapconnect to start streaming data.To disconnect, tap Disconnectsymbol.You can reach online help, information about the app andsetting from the bottom symbols.Settings lets you change thewarning levels of the AirEs 2 monitor. You can select from 3 presetconfigurations.RequirementYou need to have at least Bluetooth 2.0at least one AirEs 2 Monitor System.Aires Sensors comes in twomodels one uses Bluetooth 4.0 and the other also utilizes Wi-Fi.Youcan shop for Aires 2 Air quality Monitor online from our store,Amazon, Hepsiburada etc.NoteThis application and AirEs 2 Monitorprovides information about your air quality, temperature andhumidity. This information is not calibrated and does not intendedto provide scientific observations. Please be informed that thegadget is for indoor use only and may lose its precision over timeand depending on environmental conditions. This application is used for tracking the indoor air quality,temperature and humidity, by using AirEs 4 Air Quality Monitors.You can change sensor warning levels in the application.Easy-to-useinterface provides clear information about air quality you breath,temperature and humidity, to your phone and/or tablet. 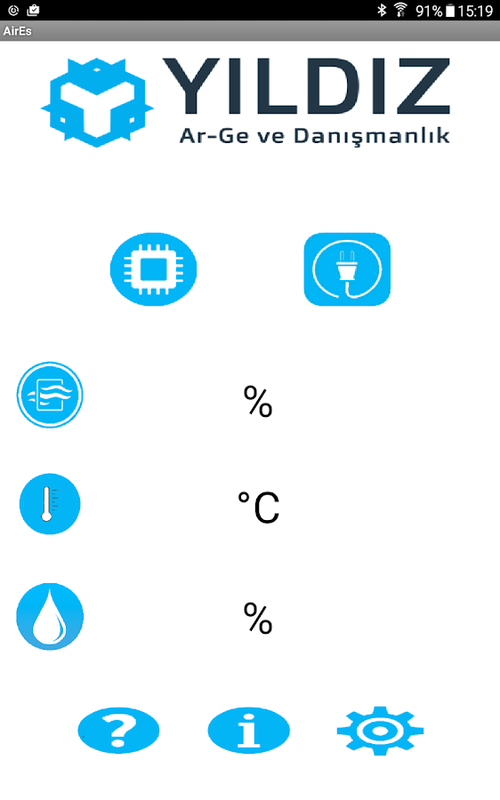 You can alsosee the lowest and highest levels recorded while the gadget ison.How to useTap the IC symbol to select the device to and tapconnect to start streaming data.To disconnect, tap Disconnectsymbol.You can reach online help, information about the app andsetting from the bottom symbols.Settings lets you change thewarning levels of the AirEs 4 monitor. You can select from 3 presetconfigurations.RequirementYou need to have at least Bluetooth 4.0and Android 4.3 on your mobile device and at least one AirEs 4Monitor System.Aires Sensors comes in two models one uses Bluetooth2.0 and the other also utilizes Wi-Fi.You can shop for Aires Airquality Monitor online from our store, Amazon, Hepsiburadaetc.NoteThis application and AirEs 4 Monitor provides informationabout your air quality, temperature and humidity. This informationis not calibrated and does not intended to provide scientificobservations. Please be informed that the gadget is for indoor useonly and may lose its precision over time and depending onenvironmental conditions.